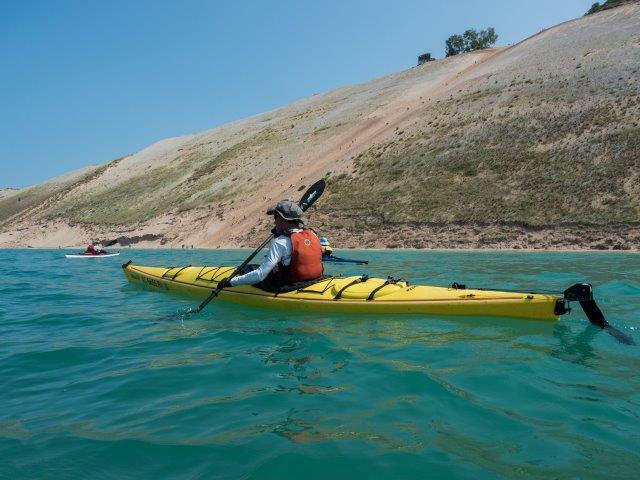 Paddle the dunes they say - it's more appropriate paddle along the Sleeping Bear Dunes National Lakeshore. 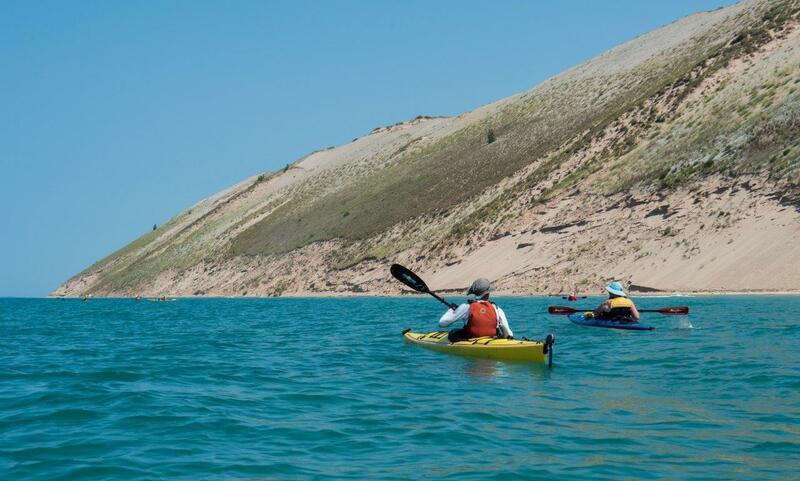 One of the most picturesque natural places to put in a kayak paddle. 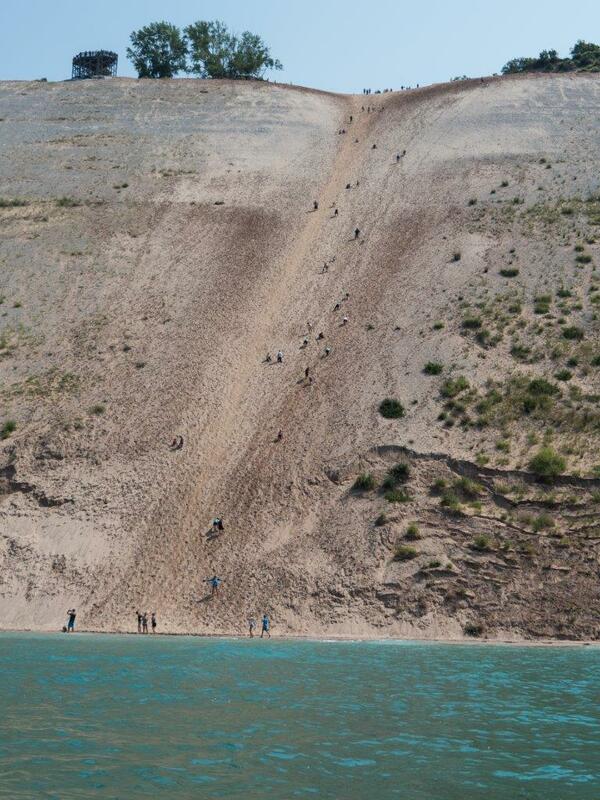 The waters of Lake Michigan were turquoise, the sky blue, contrasted by mountains of sand. 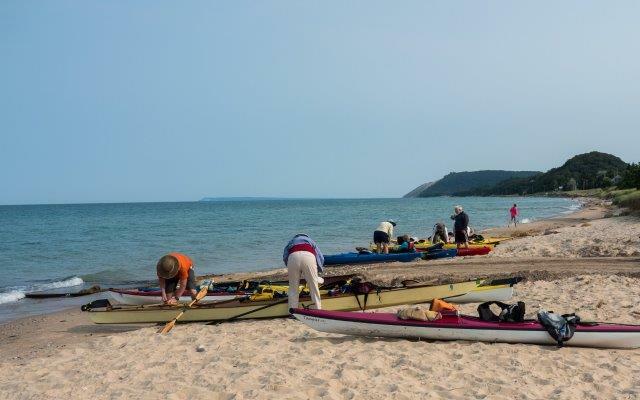 Twelve hearty souls launched into the water at Empire beach and began the journey north to Glen Haven. Lois Goldstein, always thinking about safety, made sure everyone was within swimming distance from shore, had two bulkheads in their kayaks, and were in shouting distance of one another. I really appreciate the safety aspect of this club. After about an hour and a half of paddling, we landed on shore, I surfed my kayak in, to a nutritious lunch. Jackie Anderson, who is always energetic and smiling, offered the group healthy snacks - in fact she gave me some to take home! She brought enough to feed an army! It's amazing what an appetite one can muster while in a boat. The second leg of our paddle seemed to be effortless, the wind and waves were in our favor. At one point we all held up our paddles like sails and let the breeze push us. Some of the group discovered a sunken kayak, I only hope its captain survived. 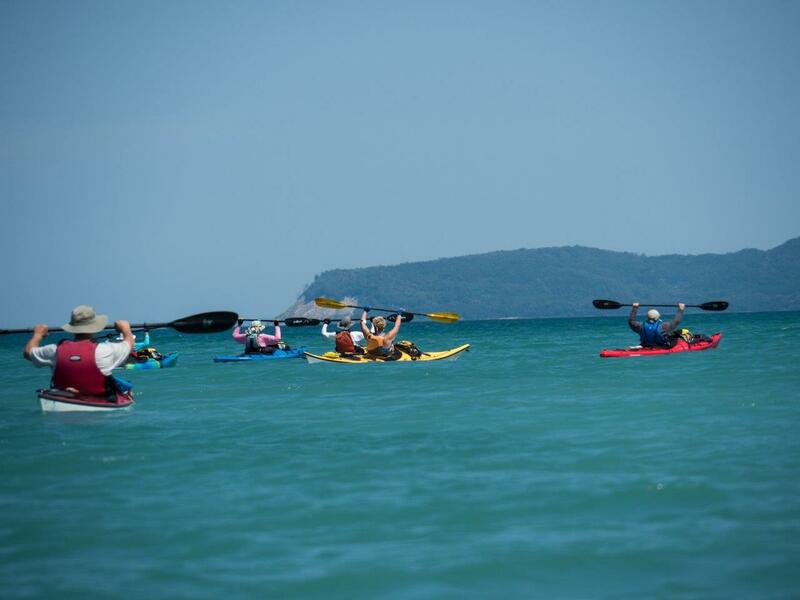 Another paddler, Gail Hastings, found the largest Petoskey, should I say boulder, I had ever witnessed. Always an adventure! Soon we had our eyes on the pull out sight, beach revelers got an eyeful of colorful boats, PFDs, and hats as we landed on the beach, some inquiring about our journey. After loading the trailer, some went out for a second lunch and others (including me) had ice cream. I am truly thankful for the TAPC, it has gotten me out on many watery adventures, always bringing me back with great memories. Also like to thank John Heiam and Glenn Bier for their help in launching everyone into the waves of Lake Michigan. Ah - the wind at our backs!